Acupuncture originated in China more than 3,000 years ago and is used to treat illness, prevent disease, and improve total well-being. By inserting sterile, disposable needles in designated points on the body, the practitioner stimulates and balances the ﬂow of Qi (“chee”), which is the body’s natural energy. Acupuncture not only helps correct chronic conditions, but it also helps prevent disease by strengthening the natural immune system. Over 20 million Americans have turned to Acupuncture. How can such an “ancient” medicine be at the forefront of the new millennium? Simple, Acupuncture works. Acupuncture can be used to alleviate muscular and internal issues. It is also effective as preventive maintenance. In other words, it is an exceptional way to correct current ailments and maintain balanced health. If a person has any imbalance in the body, symptoms may manifest as headaches, fatigue, constipation, PMS, insomnia, depression, pain, etc. Each symptom correlates to its own meridian or Qi pathway. Acupuncture is used to stimulate the Qi in the meridian connected to the imbalance, helping achieve alleviation of the symptom by removing blockages and encouraging the free flow of energy. Most people feel nothing when the needle is inserted. Acupuncture needles are solid and as thin as a human hair. In Acupuncture, we administer needles with caution, avoiding arteries and nerves. Thus, the treatment is mostly painless, but, since stimulation needs to be achieved, you may feel a heaviness or warm sensation around the needle or traveling up and down the meridian. Any kind of discomfort from the stimulation of the needle disappears in seconds. 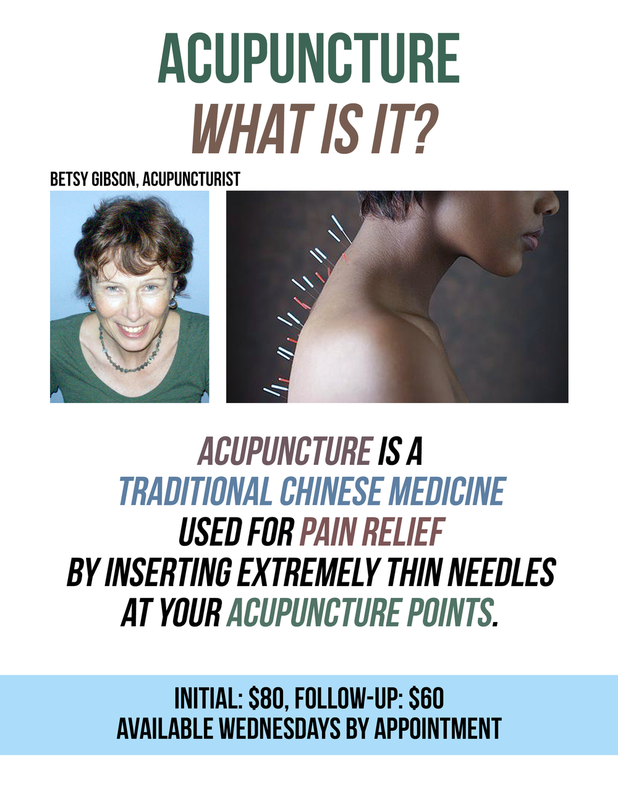 Mrs. Gibson is a graduate of the three year Masters Level Acupuncture program at the CCAOM accredited American Institute of Alternative Medicine in Columbus, Ohio. In the fall of 2007, she spent a month in China studying and practicing in two separate hospitals in Beijing. She licensed to practice acupuncture in the State of Pennsylvania.